indoctrinate verb 1. to instruct in a doctrine, principle, ideology, etc., especially to imbue with a specific partisan or biased belief or point of view. 2. to teach, inculcate or imbue with learning. Indoctrination of a person or group of people has been used throughout history and can be directly linked to wars across the globe. It is reasonable to expect that each of us has our own beliefs and points of view, but when a person has been taught or instructed to believe a (predominantly negative) biased idea then we can argue they were indoctrinated. Let us take Britain during World War I as an example. British people were not necessarily indoctrinated to believe that going to war was the right thing to do, as the facts in favour were pretty conclusive. However, the use of propaganda, one of the principle modes of indoctrination, by the British government to spread rumours of German atrocities in order to mobilise hatred of Germany can be considered indoctrination. Many of these stories were never proven, but were used nonetheless to provoke strong, biased feelings amongst the population. The difficultly in determining what constitutes indoctrination and where it is used will inevitably leave my examples open to debate, but I will use state, ethnic and religious indoctrination to try to illustrate why indoctrination is such a devastating weapon. 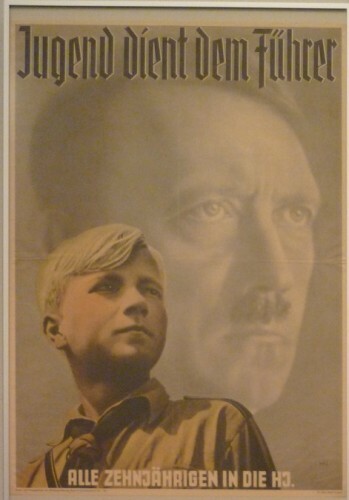 World War II arguably saw indoctrination by the state at its most destructive: the Nazis successfully indoctrinated the German people to believe that the Aryan race should dominate the rest of Europe and that people deemed ‘undesirable’ and ‘sub-human’, such as Jews and homosexuals, should be wiped off the earth. Indoctrination began with children, who were taught Nazi methods and ideology in the Hitler Youth, and grew up to be some of the most fanatical soldiers in WWII. The Japanese were also subjected to intensive indoctrination. Teaching and propaganda created deep faith in the imperial state and its leaders, and produced a fanatical population who were willing to sacrifice their lives for the Emperor. This teaching focused on the divine status of Emperor Hirohito; by fighting in the name of such a supreme being, the Japanese believed they could not lose. This concept has been utilised throughout history with Roman, Egyptian and medieval leaders also being treated as Gods, showing that indoctrination can follow similar themes. Overall, indoctrination by the state has compelled its citizens to carry out acts of war that have brought misery and death to millions. Wars of ethnicity are also subject to the use of indoctrination. A person is not born with the notion that their race is different or superior to another’s. They are also not born knowing that they must devote themselves to the destruction of that other race. This ethnic and racial indoctrination can come from a variety of sources: family and friends, school and university, or, as in the case of Nazi Germany, from the state itself. Ethnic conflicts have been especially prevalent in Africa, where tribes divided along racial lines have committed atrocities against each other. The Rwandan genocide involving the Tutsi and Hutu groups shows how destructive ethnic divides can be. It is believed that Hutu-backed media played a role in inciting violence through biased reporting of news and hate speeches, playing on long-standing indoctrination of the Hutu majority. Divisions along ethnic lines can take many years to heal and require replacing indoctrination with a positive form of teaching that promotes familiarity and unity instead of what separates people. However, history shows that this is not easy to achieve. Religion can also successfully utilise indoctrination. It can take the form of preaching and teaching at religious institutions, or from the views of family and friends one is surrounded by. Acts of war committed in the name of religion are scattered throughout history. The Crusades were conducted by Christians of Europe who believed they were doing God’s bidding by liberating the Holy Land from Muslims and Jews. Pope Urban II (falsely) declared that God would reward anyone that killed a Muslim, thus successfully indoctrinating the people. This was also a reason used by al-Qaeda to indoctrinate the hijackers that attacked America on 9/11; by martyring themselves in the name of Allah they would earn a place in Heaven. Indoctrination has caused deep schisms not just between religions, but within them as well: take the Protestant-Catholic divide within Christianity that still troubles Northern Ireland and the Sunni-Shia split within Islam that has caused massive bloodshed across the Middle East as examples. Whilst the majority of faithful people do not reach such extreme thinking, there is still a strong minority that is susceptible to indoctrination that promotes the supremacy of their religion. This has led to bloodshed in the past and will continue to do so whilst radical elements play such a strong part in religious learning. Of course, indoctrination is not the only catalyst or cause of war; each conflict has its own unique and underlying roots that go beyond the ‘brainwashing’ of a population. Some could argue that indoctrination is not a weapon at all, and that guns and bombs are the weapons used to actually kill people. However, such weapons are useless without someone prepared to build and use them. Indoctrination has to be considered one of the world’s greatest weapons because it has compelled millions of people to develop and use increasingly sophisticated mechanisms to cause harm to others. Even as the bow and arrow, trebuchet and musket became obsolete, indoctrination persevered and evolved. The success of indoctrination is that the subject invariably does not realise it is happening to them. It took the British to actually meet a German after WWI to realise that they were not all monsters, and even then negative impressions of the German people persisted. It is entirely possible that we could be being indoctrinated to believe certain things today. Could things that we take as common knowledge have been falsely imposed on us by others? It is an interesting question, and only time will tell whether we too will have been victims of the world’s greatest weapon.